This private and wooded property has 103 spaces on 38 acres, and includes duplexes and a spacious single family home. 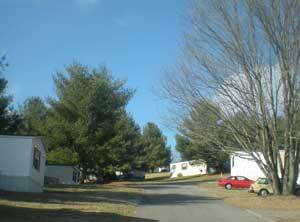 This is a great property, located at 3110 Meadowbrook Drive in Blacksburg, Virginia. Meadowbrook backs up to the Jefferson National Forest, yet is only 5 minutes from Virginia Tech. Lot rent is $292.00 monthly, with 2 and 3 bedroom mobile home rentals available as low as $450.00 a month. This excludes utilities and trash. Our pet policy is 25 pounds and under; no aggressive breeds allowed. A refundable one time pet deposit of $100 is required for each pet. School districts are Prices Fork elementary and Blacksburg middle and high. Meadowbrook has a friendly on-site manager and neighbors. It’s great place to call home.